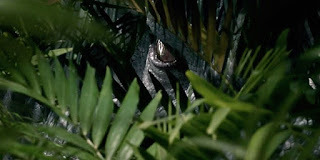 Random And Some: Is the Indominus Rex still alive? The roaring success of Jurassic World is not without consequences. Soon after JW became the highest-grossing US opener, trampling Marvel's Avengers, and fastest movie to 1 billion, stomping Fast & Furious 7, Universal announced that there will be a sequel. It will tentatively come out June 22, 2018, returning stars Chris Pratt and Bryce Dallas Howard. I'm very curious as to what direction Spielberg & Co. decide to go with Jurassic Park 5/Jurassic World 2. It goes without saying that going back to Isla Nublar (JP, JW) or Isla Sorna (TLW, JP3) will be a tough sell, since no one in their right mind would bankroll either island back on its feet. We wanted to create something that would be a little bit less arbitrary and episodic, and something that could potentially arc into a series that would feel like a complete story. This would suggest that Jurassic World 2 (and Jurassic World 3, potentially) would be tied together by more than just the characters of Pratt and Howard, creating an overarching, Avengers-style multi-movie storyline. My educated guess would be that mad scientist Dr. Hendry Wu (who escaped on a helicopter with a case of dinosaur embryos) returns. And seeing how popular the Raptor squad was, I would dare bet money on an appearance by Blue and/or other trained Velociraptors. In some capacity I also expect there to be more militarizing of dinosaurs going on. Also, perhaps more controversially, I wouldn't rule out another run for the Indominus Rex. And I'm not crazy, my mother had me tested. I didn't hear the I-Rex's neck snap. There's a very real possiblity that the Indominus could swim. Think about it. She can change her thermal temperature. She can change the color of her skin. Engineered from several dinosaur genera and modern animals, including the cuttlefish, there's no telling what else she can do. Perhaps breathe underwater?